The tastiest tangy recipe that you may prepare to please the lord on Janmashtmi. Different types of sweets and spicy foods are offered to Lord Krishna on the occasion of Krishna Janmashtami. 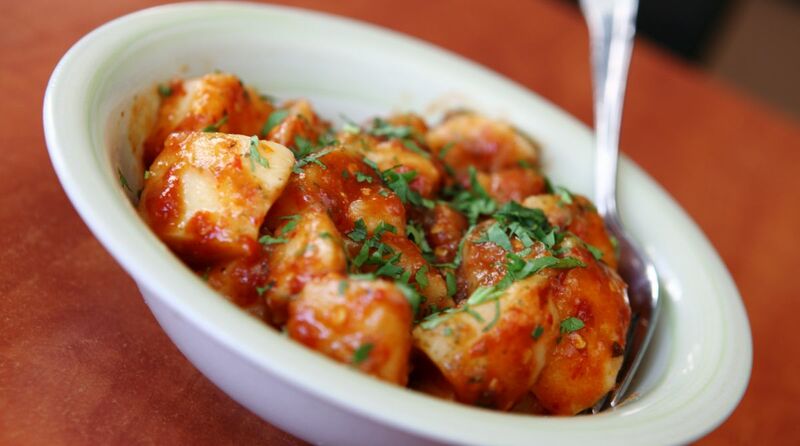 Well, there are many dishes that Krishna loves to eat, potato banana chaat is one among his favourites. It is a fried sweet and spicy snack recipe that is very easy to make and eat. Fasting people can also eat it without hesitation. So, read to know how to prepare khatti meethi potato banana chaat on Kaanha’s birthday. Give two whistles on high flame to potatoes. 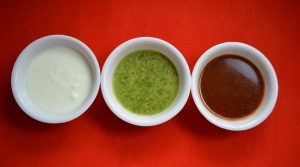 Prepare coriander chutney – Take 100 grams of fresh coriander leaves and a small bunch of mint leaves. Separate the leaves from the stems. Wash them thoroughly. Grind them in a food processor to a fine paste adding half teaspoon of sindha namak (Rock salt), two tablespoons of lemon juice and four green chillies. It’s ready. Prepare tamarind sauce – Soak one cup of whole tamarind in three cups of water for two hours after washing it thoroughly. Pressure cook it with the same water giving one whistle on high flame and then simmering for 15-20 minutes on low flame. Open the lid when pressure comes on its own. Grind the tamarind with the same remaining water in a food processor. Sieve the pulp. Throw the residue. Add one and a half cups of sugar, 2 teaspoons of sindha namak (Rock salt), 1 teaspoon of red chilli powder and one teaspoon of garam masala in it. Mix well. Tamarind sauce is ready. 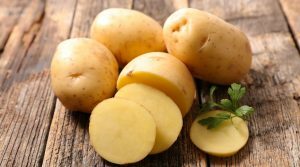 Cut boiled potatoes in big eight pieces. Deep fry them till golden brown. Cut bananas and tomato in small pieces. Now add sindha namak (Rock salt), red chilli powder, lemon juice, tamarind sauce and green coriander chutney to cut bananas, tomatoes and fried potatoes. Mix all the ingredients well. Offer immediately for the bhog when potatoes are hot and crispy. This is a crunchy, spicy snack that is prepared for Janmashtami bhog. Offer it to the Lord and then consume as Prasad. So yummy!